The Nell Hodgson Woodruff School of Nursing received $17.9 million in research funding in Fiscal Year 2018—the highest single-year of research funding amount in its history. Funding from the National Institutes of Health (NIH) accounted for $8.9 million of this total. Emory's School of Nursing is now No. 3 in NIH funding among U.S. nursing schools. Center for the Study of Symptom Science, Metabolomics and Multiple Chronic Conditions. The goal of this 5-year, $2.6 million award is to address the increasing number of individuals living with multiple chronic conditions (MCC) and in particular, Black men and women, the group most often negatively affected in the United States. The Center for the Study of Symptom Science, Metabolomics and Multiple Chronic Conditions will both strengthen the capacity of junior nursing faculty to make use of sophisticated metabolomic and microbiome technologies and cutting-edge data analytic and undertake innovative research to reduce symptoms in individuals with MCC, improving public health for generations to come. Developing a Distance Education System to Train Savvy Caregiver Program Interventionists: Extending Access and Capacity in Community-Based Delivery of Evidence-Based Interventions. This 4-year, $2.1 million project will develop a web-based system that uses distance education methods along with manuals and protocols to train, certify, and monitor the performance of interventionists to deliver the Savvy Caregiver program (Savvy), an evidence-based dementia family caregiver psychoeducation program. Maintenance and Enhancement of the Atlanta African American Maternal-Child Cohort: Exposome Profiling via High-resolution Metabolomics and Integration of Microbiome-Metabolome-Epigenome Data. This 5-year, $1.9 million award supports the continued recruitment of pregnant African American women and their infants to better understand psychosocial, biobehavioral and environmental risk factors for preterm birth and neurodevelopment through 18-months of age. It will also evaluate child obesity and neurodevelopment at 2-5 years of age under the Environmental Child Health Outcomes (ECHO) program. 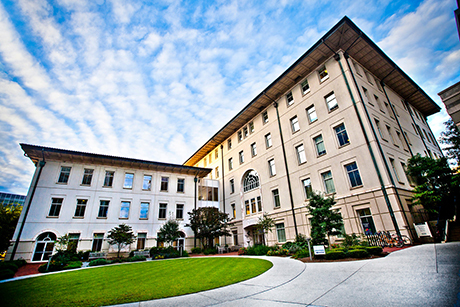 Emory University as a whole received $734 million in external research funding in FY 2018, the most ever for the university. Researchers in Emory’s Woodruff Health Sciences Center (WHSC) received more than $685.8 million in FY18, with $402.5 million in federal funding, including $345.4 million from the NIH. The WHSC includes schools of nursing, medicine, public health, Yerkes National Primate Research Center, Winship Cancer Institute and Emory Healthcare.